John Chavis heads up Texas A&M's key defensive overhaul entering the 2015 college football season. Plus, more Punt, Pass & Pork. COLLEGE STATION, Texas—Texas A&M quarterback Kyle Allen must have smiled and then frowned when he heard John Chavis was coming to Aggieland from LSU to be his team’s new defensive coordinator. The smile? Allen would never have to play another game against a Chavis defense. The frown? Allen would have to play a Chavis defense at every practice. Dual-sport dilemma: Could star QB Kyler Murray pursue an MLB career? Chavis will have to earn that salary this fall or the mood could darken considerably in College Station. The memories of an 11-2 mark in Texas A&M’s debut SEC season have begun to fade, replaced by fears that the Aggies’ 7-9 league record from the past two years represents the norm. This was not a program that annually competed for championships as a member of the Big 12. The Aggies must prove they can do that in the SEC, or the spending spree inspired by their conference realignment and success in 2012 might seem like overkill. Every day construction crews work to remodel the west side of Kyle Field to match the east, which was renovated last year. When they finish, capacity will be 102,512. Will so many people come to watch a team stuck in the middle or bottom half of its league? Chavis was hired to ensure that question doesn’t get asked. Even without Manziel and even though it dealt with a midseason quarterback swap (the since-departed Kenny Hill to Allen), Texas A&M’s offense was productive in 2014. According to Football Outsiders’s tempo-adjusted stats, the Aggies finished 24th nationally in offensive efficiency. The defense was the albatross. In ’14, Texas A&M finished 110th in the country (55.4%) in a metric Football Outsiders calls Available Yards. If the opponent started at its own 20-yard line, it would have 80 available yards and could expect to gain a little more than 44 on an average drive against Texas A&M. 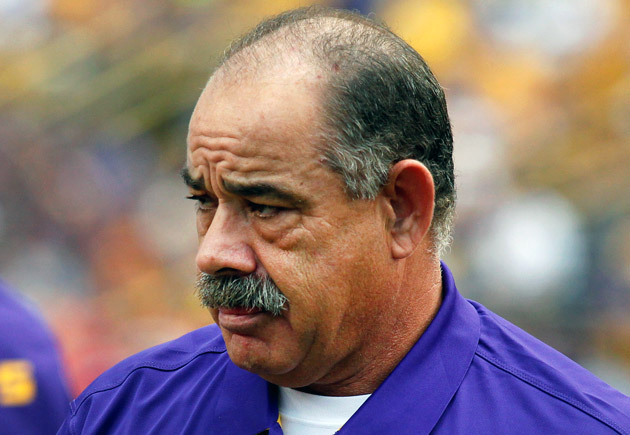 Chavis’s LSU defense finished 11th (35.8%) in that same category. A drive that started on the 20 would have gained an average of 28.6 yards against last year’s Tigers. And the 2014 version wasn’t a particularly great Chavis defense. The Tigers suffered because their offense could not move the ball consistently, forcing the defense to face short fields after taking short breaks. In fact, this may have been one reason Chavis made the move. Even in bad times, Texas A&M will usually move the ball and score points. Also, the Tigers did not have the defensive line talent to which Chavis had grown accustomed. The Aggies have at least one elite pass rusher in Garrett and another, junior Daeshon Hall, who should get pressure. But although LSU’s defensive line talent dipped, its cornerback group did not. Chavis probably won’t have corners comparable to Jalen Collins and Tre’Davious White in his first season at Texas A&M. The Aggies are solid at safety thanks to the presence of sophomore Armani Watts and the arrival of juco transfer Justin Evans, but they are thin at cornerback. De’Vante Harris is entering his fourth year as a starter, but the rest of the group remains raw. The ability of the corners will likely determine the ceiling for the defense under Chavis. From Andre Lott and Dwayne Goodrich at Tennessee to Patrick Peterson and Morris Claiborne at LSU, Chavis typically has had corners capable of locking down receivers. The reliance on man coverage—either press or catch, depending on the situation—frees up another defender to attack the quarterback as a fifth rusher. If the corners can cover one-on-one, the pressure will reach the quarterback. But if the corners get beat, it could lead to huge gains. An inability to cover one-on-one might force Chavis to alter his scheme, but at the moment he doesn’t plan to change anything. “There’s no secret about what we do,” he said. “We’re a pressure defense. Have been for a long time. That’s what we’re going to continue to do.” If the Aggies have recruited as well as their Rivals.com rankings would have us believe, then this shouldn’t be a problem. The defense has seemed perpetually young since 2013, but that could be because younger players have beaten out older ones. The Aggies will be young again this season on that side of the ball, but some of that youth will include sophomores with experience and freshmen—maybe five-star defensive tackle Daylon Mack, for example—too good to keep off the field. Sumlin was quite frank when he arrived at A&M that the roster needed an upgrade to compete in the SEC. With Sumlin’s fourth recruiting class in the locker room come June, the talent level should be adequate by now. Chavis said he had no concerns about coaching a defense that plays opposite an up-tempo offense. Such schemes usually require defenses to face more snaps during games and can lead to less physical practices, as tackling is sacrificed for the sake of tempo. “When you look, 80 or 90% of the teams you play run a fast-paced offense,” Chavis said. “So you’re playing against it all the time. To be quite honest, we practiced against it a good bit before. 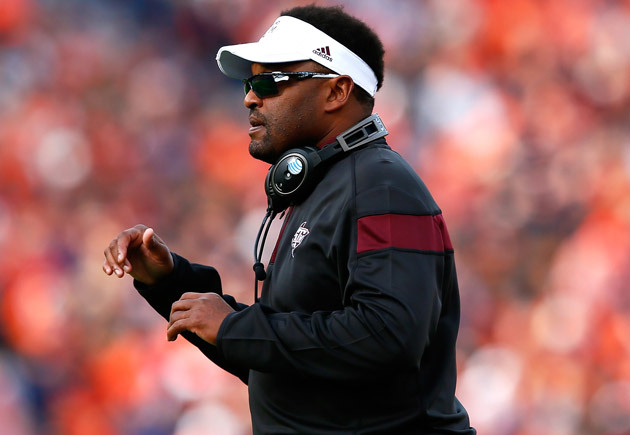 It’s kind of where football has taken us.” Sumlin said he discussed practice habits with Chavis before the latter accepted the job, and Sumlin adjusted the tempo of practice to help the defense. In fact, he may have adjusted it too much at first. “He’s the one who said after Week 1 [of spring practice] to pick up the pace,” Sumlin said. The drill should provide excellent preparation, because there won’t be anywhere for the Aggies’ defense to hide once the season begins. More than 102,000 people will stare down from the Kyle Field stands, and they’ll want to see a defense worthy of sharing the sideline with Texas A&M’s offense. If Chavis can raise the defense to that level, there is no limit to what A&M can accomplish. If he can’t, those new stadium additions will cast long shadows over a program at a crossroads. Reader Al submitted the below question too late to make last week’s #DearAndy, but I considered it my duty to dive down this rabbit hole so you won’t have to. @Andy_Staples radio played madonnas American pie this morning. What are top 5 worst cover songs? Whatever royalty money this song generated was probably spent to replace all the furniture Pete Townshend destroyed the first time he heard this abomination. Plus, the lyrics don’t include the phrase “participation trophy,” so Duff can’t possibly be singing about her own generation. How do you make Jimi Hendrix uncool? Let him get covered by Stewart Stevenson’s favorite band. Only word-for-word covers make this list. Otherwise, it would also include the Vanilla Ice tune that sampled the guitar riff from “Satisfaction.” Which is worse? Put cups under each ear, play each song and see which one causes the cups to collect more blood. You’ll have your answer. Just because a band makes a great protest song doesn’t mean it knows what to do with another band’s great protest song. 1. Sumlin offered some encouraging thoughts for those of us who would like to see Texas and Texas A&M stop being babies about it and play each other again. The blame for the lack of a Texas-Texas A&M matchup shifted between the two schools after the Aggies’ departure for the SEC, but enough time has passed and enough people have turned over for the programs to seriously consider playing again. Sumlin’s initial response to the deluge of questions about the Texas rivalry in 2012 had more to do with the overwhelming job in front of him than with the politics that ended the matchup. “I became the head coach at Texas A&M and we were in the SEC and we weren’t playing Texas,” Sumlin said. “For somebody to ask me, that was really the last thing I was thinking about. People [took] that the wrong way.” Sumlin said that if he’d previously been the head coach at Texas A&M, he probably would have considered the rivalry a higher priority. But at the time he was worried about competing with Alabama, Auburn and LSU. Now, Sumlin has a better understanding of why his fans keep asking to have the rivalry renewed. “Now, moving into year four and listening to our former students and our alumni base and knowing a lot of Texas alums, it’s important,” he said. “I think it will happen somewhere down the road.” Last year Texas coach Charlie Strong said a series with the Aggies “needs to happen.” So, it’s just up to the guys in suits to actually schedule the game. 2. I originally mentioned this when discussing Chavis’s lawsuit against LSU over the buyout Texas A&M isn’t paying, but last week provided a perfect example for why programs just need to pay the buyouts when they hire sought-after assistants. The Austin American-Statesman and the Associated Press obtained depositions from Strong and co-offensive coordinators Shawn Watson and Joe Wickline in Oklahoma State’s suit against Wickline over the $400,000 buyout Texas refused to pay when Wickline was hired to coach the Longhorns’ offensive line. The language in Wickline’s Oklahoma State contract stated that no buyout was owed if he became the primary play-caller at his new school. Everyone knows Watson calls the plays, so Oklahoma State sued. Maybe next time Texas athletic director Steve Patterson will calculate how much it’s worth from a p.r. standpoint to prevent his head coach from getting dragged into a suit where exchanges such as these are introduced into the public record. Q. Okay. Arkansas game, ran 43 plays. How many of those did—were—was Joe Wickline responsible for? Q. Not much offensive production that day. A. 43 plays. Not much at all. Q. A lot of offensive—I mean, a lot of running plays that game, weren't there? Q. So did Joe call most of the plays on that day? A. I don't remember. It was an awful day. It's—I don't want to remember that game we were so bad. Q. Between your two guys calling offensive plays that day, who called more of them, Joe or Shawn? Q. Who are your current quarterback on your—on your team right now? Q. What's his—what's his first name? A. He goes by Swoopes. Jerrod Heard. What's my man's first name? I—done went blank on me. Q. That happens to me. I call them senior moments. We're getting up there. 3. Darius Rucker, whose cover of “Wagon Wheel” is as geographically inaccurate as the original version by the Old Crow Medicine Show, caught a touchdown pass in South Carolina’s spring game. 4. Elsewhere in the SEC East, Florida pitted its first team against its backups. That isn’t unusual in a spring game. What is unusual is that the first-team line—such as it is because of injuries—struggled to block the backups and walk-ons. After the game Gators coach Jim McElwain hinted at more bad news. The Gators have six freshman offensive linemen arriving this summer, including five-star tackle prospect Martez Ivey. Some may be pressed into action early. 5. Two hours to the northwest of Gainesville, the freshmen were already shining. Florida State’s early enrollees were the standouts of the program’s spring game. Safety Derwin James returned an interception for a touchdown. Tailback Jacques Patrick ran for a score. Receiver George Campbell caught a 65-yard touchdown pass. Quarterback De'Andre Johnson threw two touchdown passes. The first three will likely see action this fall. Johnson will probably begin the year slotted behind junior Sean Maguire on the depth chart. 6. It’s probably tough to work in the p.r. department at Nike. Boss: Take a look these pictures of TCU’s new uniforms and write up some copy that makes having frog scales on jerseys and pants seem cool. But our dedicated flak came through with this poetic release. The new uniform design is one of the first to include a full sublimated pattern on the jersey and pants. Like the fierce, desert-dwelling mascot, the horned frog, the TCU football team uses speed, quickness and defensive tactics to outwit opponents. The horned frog’s scaly body armor inspires the new sublimated pattern—a digital evolution of the program's existing lizard skin pattern. Covering the entire jersey, and extending through the pant, the motif embodies the fearless attitude that defines both the mascot and the team. 7. In less sartorial TCU news, Horned Frogs coach Gary Patterson ripped the College Football Playoff selection committee last week for leaving his team out of the four-team field at the end of the season. What’s interesting about this situation is the team that got the spot TCU coveted (Ohio State) went on to win the national title as a No. 4 seed. So, including Ohio State wasn’t a bad decision. The question is: Which team (Alabama, Oregon or Florida State) should the Horned Frogs have replaced? 9. Rich Rodriguez let fans call plays at Arizona’s spring game. The first fan has already been hired as the offensive coordinator at a Division II school. Now I have Winger stuck in my head and I can’t get it out. The things I do for my readers. Lies have been told since the serpent sold Eve on a bite of the apple, but few have been so blatant as the one written in Sharpie toward the bottom of that scrap of cardboard. Just barbecue? Is gold just metal? Is the Taj Mahal just a house? Is the Grand Canyon just a ditch? Calling what Killen’s serves “just barbecue” is like calling love “just a feeling.” To call the meat from Killen’s pit “just barbecue” gives far too much credit to so many slingers of inferior smoked meat and far too little to the man in Pearland, Texas, who graduated from Le Cordon Bleu and sharpened his knife on steaks before turning it on brisket and beef ribs. Ronnie Killen runs an eponymous steakhouse in this Houston suburb, but two years ago he began to experiment with selling meat cooked over indirect heat. He began serving barbecue with a pop-up store, and that pop-up gave way in 2014 to the brick-and-mortar location on East Broadway. On Sunday the specials board read like one swiped from a steakhouse. 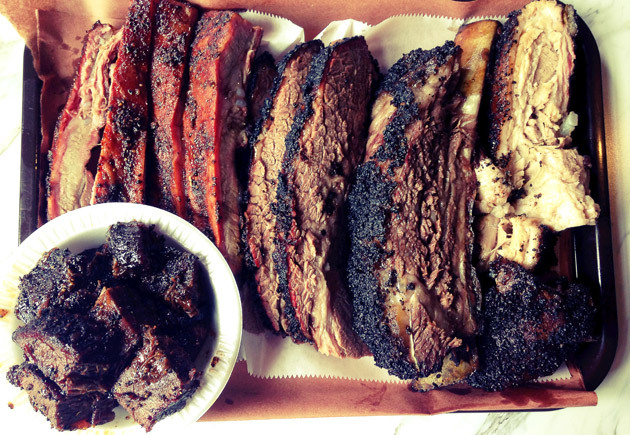 But instead of Wagyu ribeye, filet and New York strip, Killen’s offered Wagyu brisket, burnt ends and beef ribs. This was in addition to the standard brisket and beef ribs Killen’s serves Tuesday through Sunday alongside pork ribs, pulled pork, turkey, sausage and bone-in pork belly. The prices for the specials ($25 a pound for the Wagyu brisket, for example) edged closer to steakhouse range, but with meat prices rising throughout the country, the cost of the premium stuff didn’t differ that much from the cost of the regular stuff at other top-shelf barbecue joints. The difference between Killen’s and those places begins with that take-a-number dispenser. Instead of forcing his customers to stand in line for hours come rain, sleet or Texas in July, Killen trusts them to take numbers and police themselves. No fights broke out Sunday. Numerical order could not be debated. Neither Houston assistant athletic director David Bassity nor I noticed the part about each taking his own ticket. We shared No. 45. We agreed we wouldn't waste valuable stomach space on sides or dessert. We would order five pounds of meat. Those five pounds were divided thusly: a pound of Wagyu brisket, a pound of Wagyu burnt ends, a Wagyu beef rib (it weighs what it weighs), a pound of pork ribs and a pound of pork belly. The pork belly melts in the mouth, but those who watched too many “The Other White Meat” commercials might not recognize the cut that usually gets cured and turned into bacon. Savor a little, but don’t take too much. The molten fat makes this one too rich for more than a few bites. The pork ribs passed the Pull Test—a gentle tug should be required to pull meat from bone, but it should pull off clean—and were coated in a sweet, spicy rub that grew more complex with each bite. I wish we had ordered the standard brisket or beef rib, because while the Wagyu versions were delicious, the heavy marbling made it difficult to eat more than a few bites. This was rich man’s food served at an upper-middle class price. I only wished it had been a little less rich so I could have enjoyed it longer. Both brisket and beef rib came covered in the incredible bark only the masters seem capable of creating. Killen’s brisket could share a plate with the brisket from Franklin Barbecue in Austin or Pecan Lodge in Dallas. Killen’s beef rib could compete with the beef rib from Louie Mueller in Taylor. That last sentence is akin to saying a young cornerback could cover receivers about as well as Deion Sanders. All of these dishes were excellent—among the best of their kind. Yet I would have traded them all for four more pounds of the burnt ends. While the rich Wagyu meat made the brisket and beef rib heavy, it allowed the burnt ends to stand up to the extra time in the smoker. 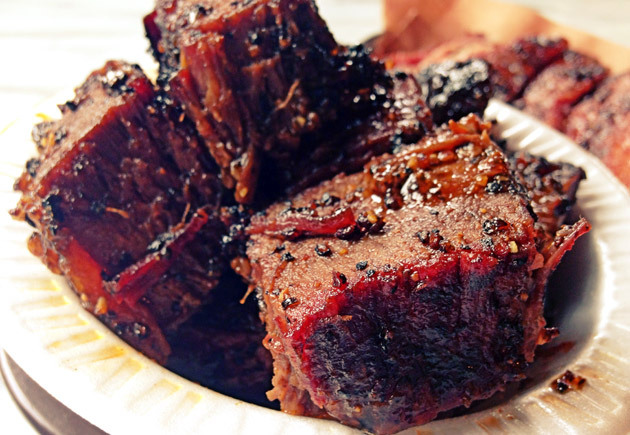 Burnt ends usually require a trade-off. To get the smoky, almost bacon-y flavor from the fatty point section of the brisket, some moisture must be sacrificed. Usually the flavor makes it worth the extra chew or the effort to apply a few drops of sauce. But Wagyu beef has so many tiny channels of fat throughout the meat that the burnt ends can attain the desired crispy, smoky flavor without drying out the meat. So, what Killen’s served Sunday were huge chunks of crispy, juicy, perfect meat. Along with Franklin’s brisket in Austin, Archibald’s ribs in Northport, Ala., and Rodney Scott’s pulled pork in Hemingway, S.C., Killen’s burnt ends were among the finest meats cooked low and slow and then put up for sale. Only if Willie Nelson is just a singer and Texas is just another state.